Tipu Sultan, also known as the Tiger of Mysore, was the de facto ruler of the Kingdom of Mysore. His full name was Sultan Fateh Ali Khan Shahab or Tipu Saheb Tipu Sultan. In addition to his role as ruler, he was a scholar, soldier, and poet. He always carried a rosary and was particularly fond of magnificent pearls. At durbar, he wore a red, purple, pale crimson or green turban, embroidered with threads of gold and jeweled sarpech. In later years, Tipu eschewed coloured garments, but still wore a green turban. 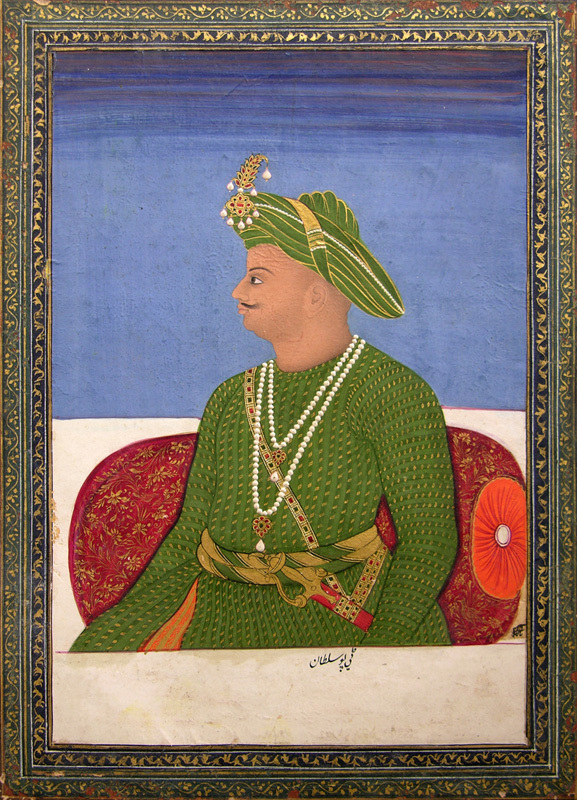 This portrait of Tipu Sultan was done by the artist Mohammad Malik during the Company Period. The term Company Period is used by art historians for a special type of Indian painting which was heavily influenced by European taste. An attempt was made by the Indian artists to work in a mixed Indian European style, which would appeal to the Europeans who were employed by the various East India Companies. During the final stage of Tipu Sultan’s life, many Indian as well as British artists painted his portraits.